When you ponder the task of writing a novel, the idea alone seems to come with certain cultural longing, the sense that everyone with a love of words has had the urge to do the same. Write a novel, that is. Some talk about it, some have tried and failed, some have worked hard and succeeded; even the phrase, “the great American novel,” is an embedded part of our national lexicon. Writing a novel seems to be an almost mystical journey, a creative vision quest filled with trials and terrors, but still, and always, a goal of profound eminence. And it is. It really is. 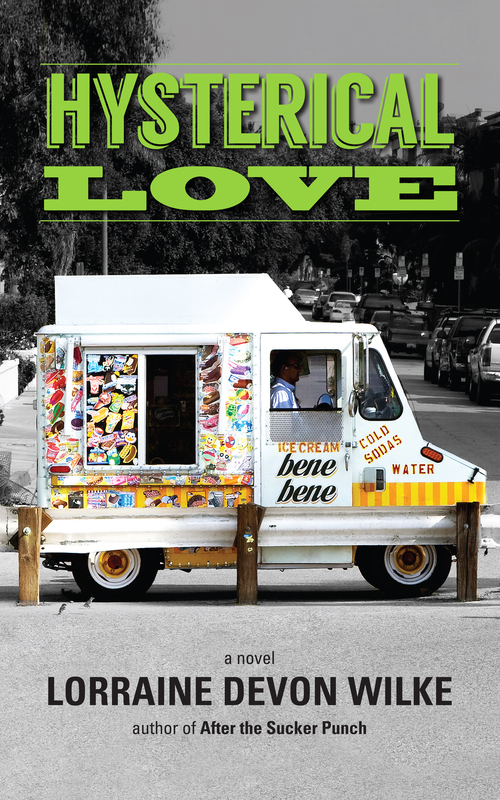 It’s a singularly stellar experience, a creative process I seriously love, and one I’ve had the good fortune to experience twice (so far), first with my debut novel, After the Sucker Punch, and, most recently, with the completion of my latest, soon to be released, Hysterical Love, publication date, April 7, 2015. I’m excited to introduce the book with the colorful prelude above, the cover designed by Grace Amandes, who also created the evocative cover of After The Sucker Punch. 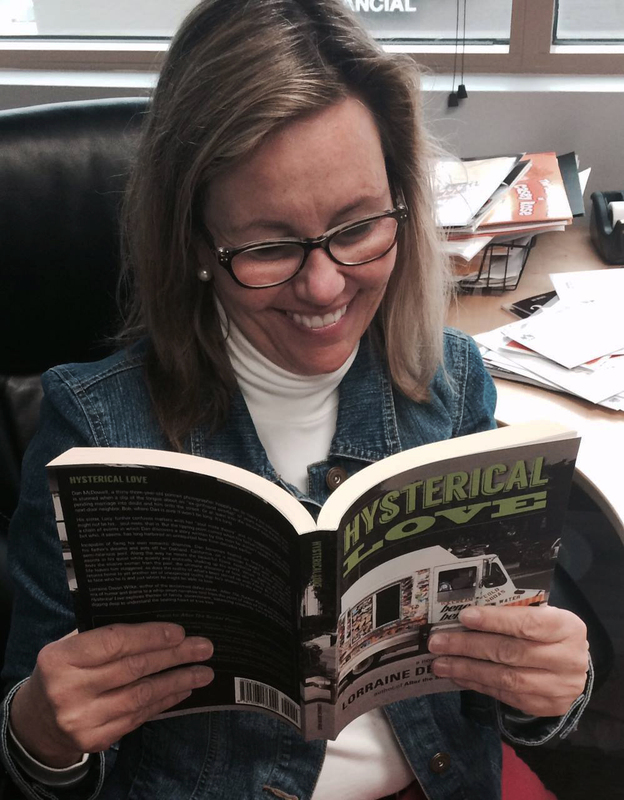 My publicist, Julie Schoerke of JKSCommunications, enjoying an advanced read of Hysterical Love! I’m sharing this with you now, so many months ahead of the pub date, because this go-around I’m working with a top-notch publicity company, JKSCommunications, whose team, led by the indefatigable Julie Schoerke, is currently rolling out a robust pre-launch campaign to get this new book properly and prominently introduced, launched, and promoted. As in indie writer, it’s exciting (even comforting) to have a team of highly skilled, warmly accessible, and incredibly enthusiastic professionals getting in the trenches with me, a place that tends to be lonely for those of us publishing on the path considered “non-traditional.” I’m delighted to have their collaboration and guidance, and certainly the shared intent to make Hysterical Love a smashing success in all the ways it can be. Incapable of fixing his own romantic dilemma, Dan becomes fixated on finding this woman of his father’s dreams and sets off for Oakland, California, on a mission fraught with detours and semi-hilarious peril. Along the way he meets the beautiful Fiona, herbalist and flower child, who assists in his quest, while quietly and erotically shaking up his world. When, against all odds, he finds the elusive woman from the past, the ultimate discovery of how she truly fit into his father’s life leaves him staggered, as does the reality of what’s been stirred up with Fiona. But it’s when he returns home to yet another set of unexpected truths that he’s shaken to the core, ultimately forced to face who he is and just whom he might be able to love. Hysterical Love offers a deft mix of humor and drama in a whip-smart narrative told from the point of view of its male protagonist, exploring themes of family, commitment, balancing creativity, facing adulthood, and digging deep to understand the beating heart of true love. Nearly busted broke, but how could I miss this? Just ordered! Really looking forward to it, Lorraine.